Not exactly the canonical opening of Don Quixote. Cervantes’ classic Spanish novel told of the comic adventures of an old man of La Mancha whose brain had dried up reading books about knights-errant and who went to war on windmills, thinking they were giants. What happened to Mike Inik, “just a U.S. lunatic,” is a little less clear. 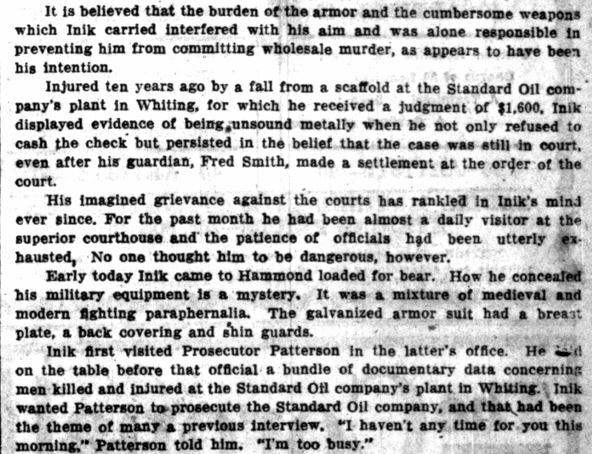 On December 4, 1916, while wearing a bizarre homemade suit made out of iron armor and kitchen pans, 49-year-old Inik shot up the Lake County Superior Court in Hammond, Indiana. His grievance? The disputed decimal value of a disability check he’d hung onto for seven years. Inik’s origins are obscure. A Google search for the last name turns up just a couple of examples, most of them in Turkey. 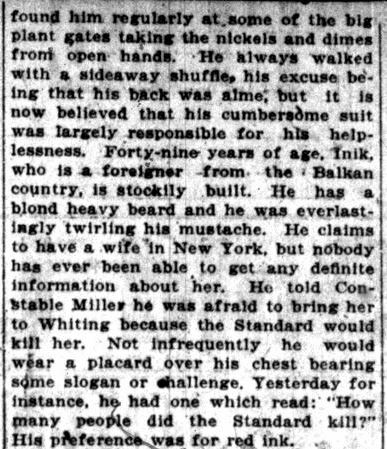 The Lake County Times says he was an immigrant from the Balkans, which used to be part of the Ottoman Empire. 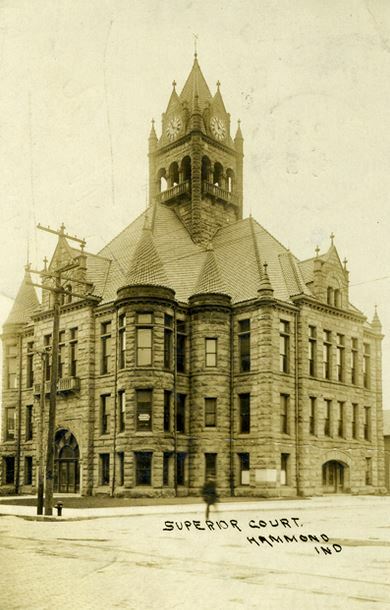 Mike, however, had been the town “character” in Whiting, Indiana, as far back as 1889, when he was injured by a piece of pipe that hit him in the back or head while working at a Rockefeller-owned oil refinery. Another account said he fell off a scaffold. At that time, the Whiting Refinery on Lake Michigan, founded the year of Mike’s injury, was the largest in the United States. Today it’s owned by BP. Doctors judged that Inik suffered from “monomania.” No longer used as a psychiatric term, in the 1800s it denoted a form of pathological obsession with one thing — yet an otherwise sound mind. On the 1880 U.S. Census, monomania was listed as one of just seven recognized categories of mental illness. Monomaniacs ranged from misers like Ebenezer Scrooge in his counting-house, to Poe’s madman fixated on an old man’s “vulture eye,” to the criminal in a Sherlock Holmes story hell-bent on smashing busts of Napoleon. Maybe the gold-obsessed Spanish conquistadors could be thrown in there, too. 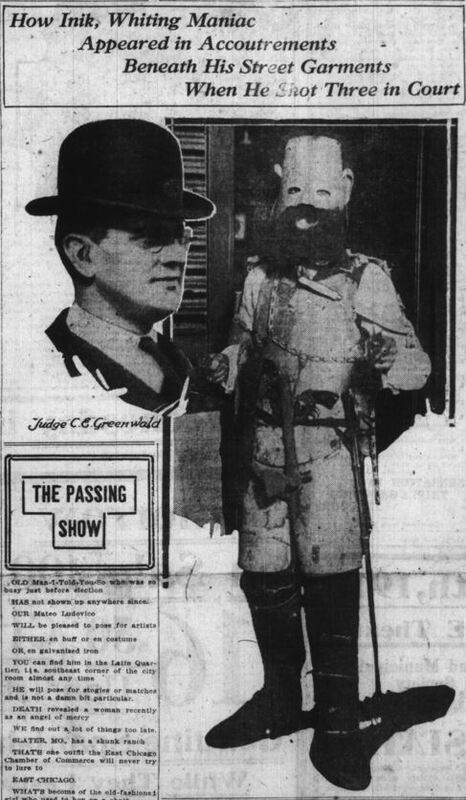 Inik, who dressed like a conquistador, directed his “monomania” at John D. Rockefeller’s Standard Oil. 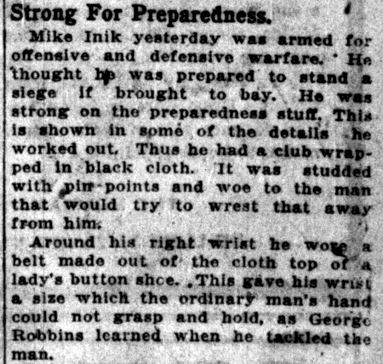 Lake County Times, December 5, 1916. Hoosier State Chronicles. 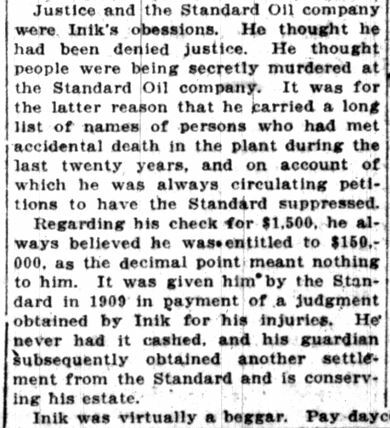 In 1913, Inik even allegedly traveled to Washington, D.C., to take up his case with the President. 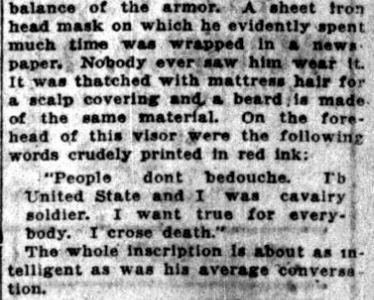 Escanaba Morning Press, Escanaba, Michigan, February 13, 1913. 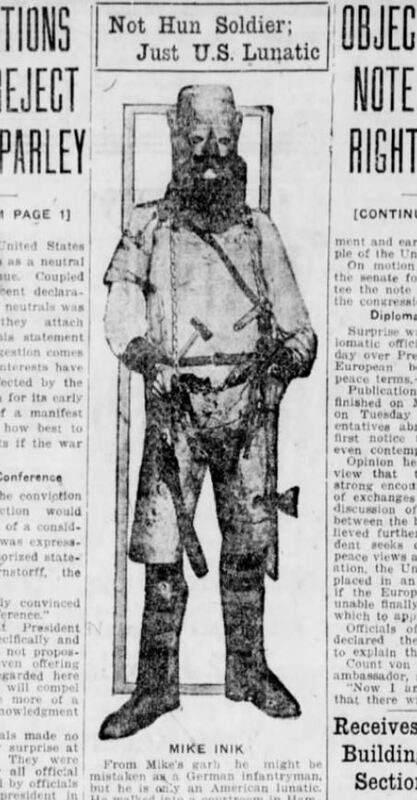 The Lake County Times account gives the impression that this “lunatic” touted his suit of armor around town for a long time — perhaps to protect himself from falling pipes? Lake County Superior Court, Hammond, Indiana. When he came to court on December 4 to hear another trial about the status of his disability settlement, Inik was wearing his protective covering and arsenal. Oddly, it seems nobody noticed the weapons. He even spoke with a county prosecutor in his office beforehand while wearing full battle regalia under his clothes. The gear Inik carried consisted of four .38-caliber revolvers, clubs, and “hatchets galore” — including a saber, hammer, butcher knife, and blackjack, plus 165 rounds of ammunition. Somehow concealed from view, Inik’s bizarre get-up was put together out of bits of galvanized iron, dishpans and washboilers. As Judge C.E. Greenwald berated the injured man and told him to go home and take a bath, Inik became irate and suddenly opened fire. 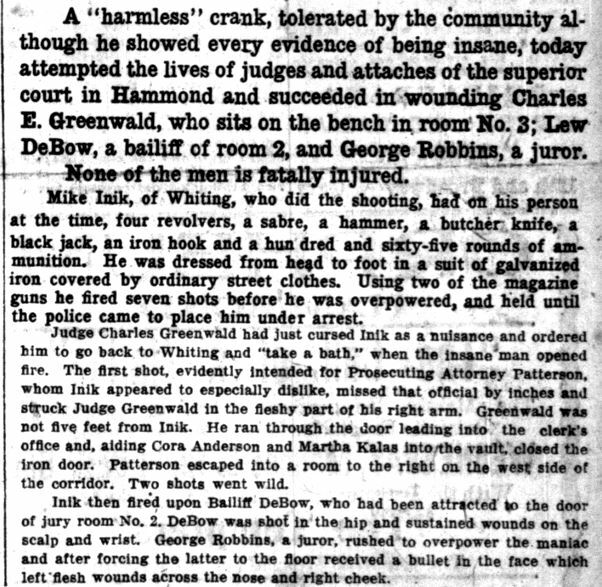 He managed to get off seven rounds, injuring a bailiff and a juror, before a group subdued him. 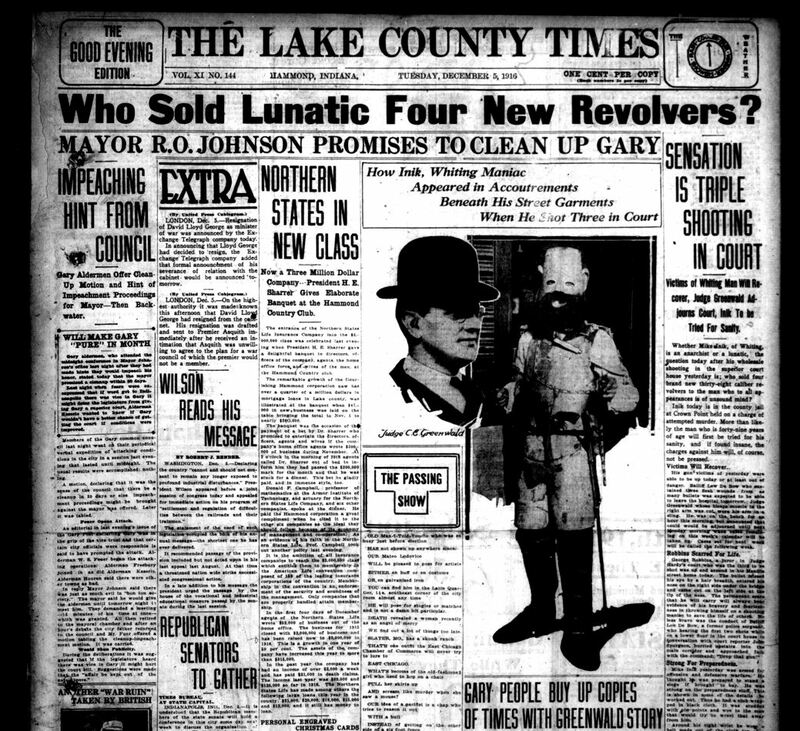 Lake County Times, December 4, 1916. Hoosier State Chronicles. Did he pose for the press photographer? 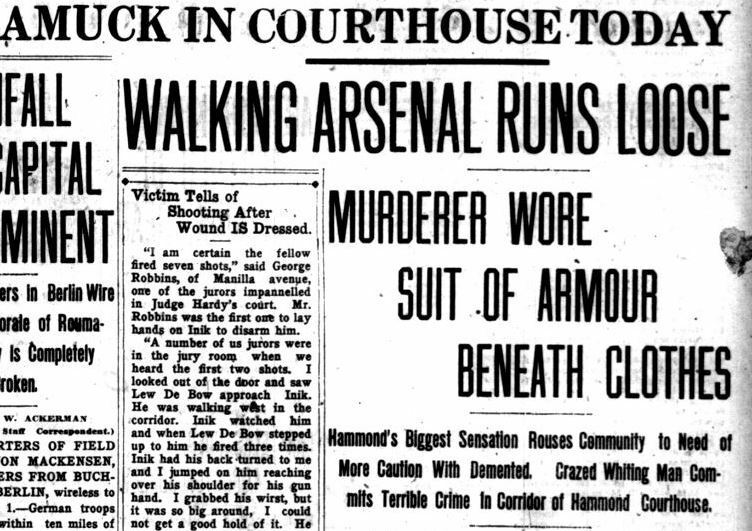 Lake County Times, December 5, 1916. Hoosier State Chronicles. Thrown in jail in Crown Point, Inik quickly went on trial again for his mental health. This time, Judge Walter Hardy consigned him to the “booby hatch,” the psychiatric ward or “colony for the criminally insane” at the Indiana State Prison in Michigan City. What became of him after 1916 is a mystery.